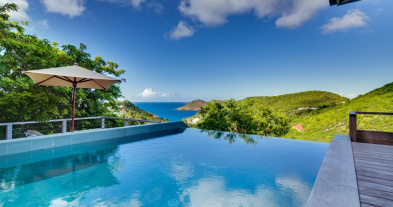 Villa AVALON is located in the Gouverneur area of Saint Barthélemy within minutes of the beach and shopping. 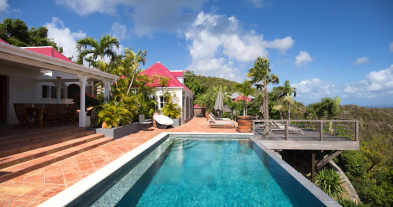 This four bedroom villa has a big pool in the terrace with 200 degree views to the ocean and Caribbean horizon. 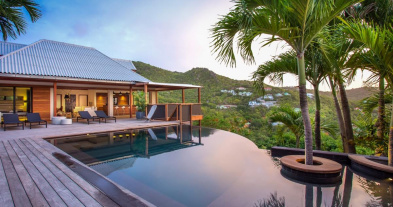 Villa AVALON is a contemporary 4-bedroom villa nestled on the heights of the Gouverneur within minutes of the beach and shopping. 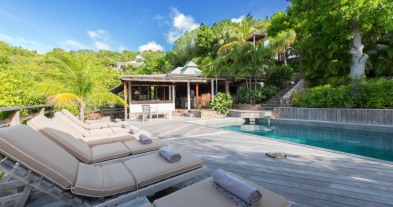 This villa is conveniently located for exploring the island and boasts a quiet location, which is perfect for reading and relaxing. Sun lovers will be seduced by this villa facing the ocean and the fabulous sunsets. The villa has 3 bedrooms on the main level, while a fourth bedroom is located on the lower level, all air-conditioning and each with its own bathroom. Its large living room overlooking the infinity pool and deck invites you to relax. The well-equipped kitchen allows guests the opportunity to cook with local and French ingredients. Gather around the outdoor dining table to enjoy the Caribbean breeze. The Villa AVALON is equipped with Dish-network satellite, code-locked safes, and WiFi. Well-equipped outdoor kitchen. Open to the living room. Breakfast bar. Mixer, ceiling fan, coffee maker, dishwasher, espresso machine, freezer, gas stove, ice maker, microwave, toaster, oven. 1 king-size bed, mosquito screens, U.S satellite TV, air conditioning, safe, ensuite bathroom with an outside shower. Ocean view. Opens to the pool.1 king-size bed, walk-in closet, mosquito screens, U.S satellite TV, air conditioning, ensuite bathroom with shower. Ocean view. Quiet bedroom near the kitchen. 1 King-size bed, mosquito screens, U.S satellite TV, air conditioning, ensuite bathroom with an outside shower. Ocean view. Large bedroom located on the lower level with lounge area, a garden view and private terrace. Great for teens. 1 King Bed or 2 Twin Beds, mosquito screens and U.S satellite TV, air conditioning, ensuite bathroom with shower. Large deck terrace with sunbeds, covered lounge area, 10x3.2m swimming pool with steps and pool alarm with key. Deck chairs. View on Gouverneur. Tropical garden all around the property. Private entrance with parking spaces.